As you already know, I like re-creating meals with some twists from restaurants or eatery places that I have visited. It is fun to brain storm what is in the sauce or soup. One of the restaurants I like to go to is Olive garden. In their soup menu, I like ” Zuppa Toscana” and “Chicken and Gnocchi soup”. One night, I decided to recreate this soup at home and making gnocchi from scratch. The gnocchi came out pillow soft and I am happy with the result. Since we have a little son who likes tender food, and I worried if I made it too hard, it might choke him with less teeth in his back molar area.Therefore, my gnocchi in this recipe is touch softer than I myself would prefer but it was all good. If you prefer harder gnocchi than mine, you can add in more flour to your preferred softness in the dough. 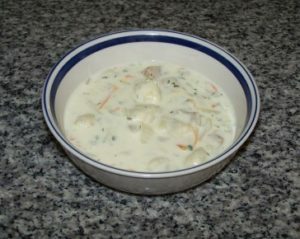 Chicken and Gnocchi soup …. 8. Cut off plastic wrap and place it over small baking sheet and place extra gnocchi you made and cover them with another sheet of plastic wrap and place the baking sheet in the freezer so you can freeze the gnocchi for the next time. When gnocchi gets frozen put them in the freezer bag and keep them in the freezer. 1. To small baking sheet, line the non stick foil and place 2-3 boneless skinless chicken thigh (about 8 oz) and sprinkle kosher salt and pepper all over and let them sit for 15 minutes.